Congratulation to Angela! You are the winner! I sew from the children’s books, but not for the adult-sized books, so I would love to try this one Thanks for a great giveaway! Now it's time for the third giveaway! 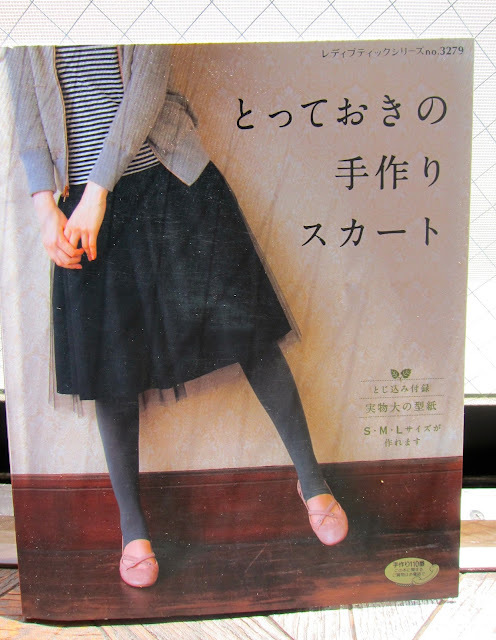 If you are into skirts, this book is for you! You can look inside the book on Amazon.co.jp. This giveaway is co-hosted by Yi Farn from Japanese Sewing Books and I. To enter the giveaway, just leave a comment about anything that crosses your mind - the state of international affairs, the book you are currently reading, today's weather forecast or your current sewing project. At the end of each giveaway period (schedule included at the very end of this post), Yi Farn and I will draw one winner from those who have commented on either blog (maximum two entries per person, for leaving a comment on each blog). Can I also comment with thought on this giveaway? Cause it's really cool! thank you for another chance to win such a yummie book!!! I have just discovered how amazing skirts can be. Thanks for the chance to win this book! And good luck with your move. INNNNAAAAA!!! Can I win even if we're friends? Love skirts. I live in them. I'd love this book. These skirts look amazing!! I would love to own a copy of this book! Today, I am going through many old, dusty things in attempts to lessen the amount of things I have in my room. As I am typing, I am enjoying the breeze from my window and my cat sitting on me. Hi there! Thiѕ blоg post couldn't be written much better! Reading through this post reminds me of my previous roommate! He continually kept preaching about this. I will forward this information to him. Fairly certain he's going to have a good reаd. Just having a quick coffee, then I'm going to sew, sew sew :) Great giveaway!